Not long ago it was a Sunday morning. I opened my eyes before my alarm rang (yes I set the yoga alarm on Sundays) and listened to the birds. One nit was up and reading quietly in her room. The other was still sound asleep in his. The cat was curled up on the stair. Sunlight filled the room despite the window shades. I felt good. Awake. Content. Nothing hurt. I felt so fine, in fact, that I decided to skip yoga and do something I almost never do; stay in bed and read. 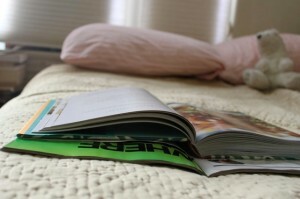 There is a stack of magazines that lives on the floor near my bed. I could work my way through that, I thought, and be entertained, AND productive. So I made my tea. Put together a small dish of yogurt with honey and walnuts. Climbed back into bed. And still nobody upstairs stirred. I dove into Bloomberg/BusinessWeek. In another lifetime I worked for BusinessWeek, as an editor and writer and so my mother gets me a subscription every year for Christmas. I can tell you what CDO’s, IPO’s, LIBOR and M2 are, but thankfully nobody asks anymore. Sitting in bed, in my pajamas, with a cup of tea in hand, birds chirping and my children slumbering upstairs, I started to feel low. Burdened. Increasingly unhappy with myself. Here I sat in middle age, never having gotten a Harvard MBA. Now I will never work at Goldman Sachs. I don’t the next generation Green business model. I’ve never been invited to speak at TED and I don’t have a single idea for an iPhone app. This is not how I want to feel on Sunday morning, with birds chirping outside my window and my kids still upstairs. I threw the Bloomberg/BusinessWeek aside and picked up my new cookbook. This one. 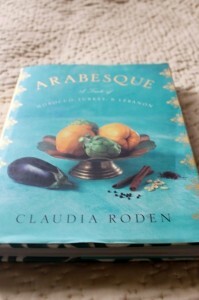 Arabesque: A Taste of Morocco, Turkey & Lebanon, by Claudia Roden. I recently bought this at the Borders Bookstore that was closing down due to its bankruptcy. I’ve wanted it for several years — Middle Eastern Food is my ruin — but balked at the price. It was 50% off so I snapped it up. Wouldn’t you? Can you see that it’s turquoise? And gold! Money well-spent. Just looking at the cover put me back in my happy spot. So I spent the next hour reading through the recipes of the levant, and imagining the taste of pistachios and saffron and rose-water and quince. Of bell peppers stuffed with rice, raisins and pine nuts, and of milk and almond pudding. And that’s where the kids found me, when they finally ventured downstairs, moaning over color photos of philo pastry delights and creamy feta cheese on azure Moroccan plates. Mom, can you make pancakes for us? And is there any more tea? Yes and yes. I got out of bed and padded into my pantry to find the flour and sugar. I turned on the Kitchen iPod and fed the cat. And it was a good Sunday that started in bed with a cookbook. Reading a cookbook for the entertainment value. Interesting. Then again, somehow, I’m not at all surprised. Now where’s that “like” button? MFK Fisher got me through a bad break up not too long ago; finding peace via recipes is something I can definitely relate to. Julie, I love this! And can so relate. Bravo! there’s nothing like reading a beautifully written cookbook to you to a better place.